Kossuth Klub, Budapest, June 3-4. 10 o’clock Introduction: Why did we organize this conference? 16 15 L. G.: Who is an economically useful citizen? 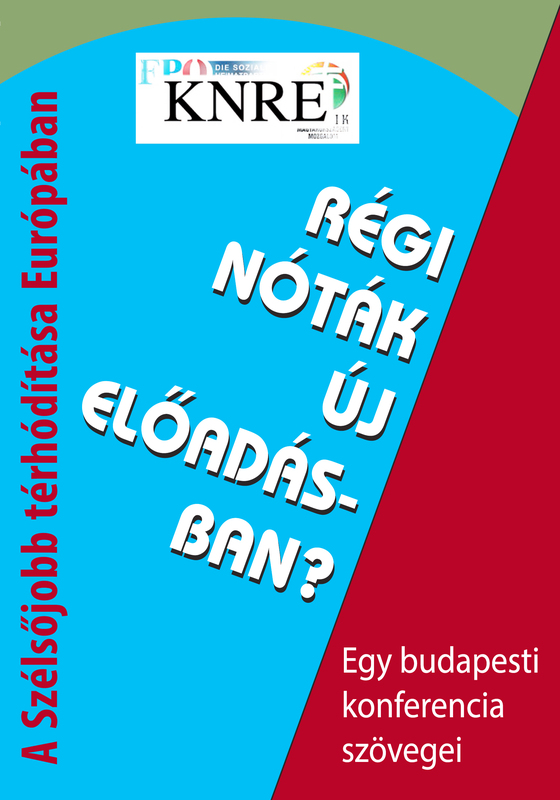 16 15 András Tóth: Who votes for the Jobbik? The movements of the extreme right now surging in Eastern Europe are a systemimmanent phenomenon. In the lecture its socio-economic and historical-traditional reasons shall be shown, and regional characteristics will be referred to. A further topic is the shortcoming of the measures taken in order to contain fascist groups, and the reasons for and consequences of such politics. HERBERT AUINGER / AMELIE LANIER: What is nationalism? An analysis of nationalism is being presented which does not linger on the surface of the phenomenon but proceeds to the matter – quite unusual, and therefore controversial. Its reference to the democratic state is crucial. In a democratic state, too, it is self-evident that „we“ are Austrians, Hungarians, and so on. But what do all those citizens have in common which results in the mentioned „we“? Nationalists answer this question by pointing either to language, culture, history and/or race, or the “social contract” which allegedly unites the members of a state. In this lecture it will be argued coherently that both of these arguments are unsustainable, as being „Hungarian“ or „Austrian“ is a result of being subdued to the universal power of the state. Furthermore this analysis explains the reasons for the identification of the subjects with the state which governs them – this and nothing else is the core of all nationalism –, and why fascism is just the radicalization of democratic nationalism. Postfascism is a subordinated aspect of the tendencies of biopolitical social exclusion: it is applied to everyone who isn’t “productive” and whose income therefore isn’t “justified”, that is, does NOT stem from capital or labour. With their paranoid ideological rudiments the new fascists react to the hypocrisy of liberal capitalism after 1989 – by expressing the essence of this capitalism, but straightforward, without any hypocrisy, while at the same time being convinced themselves that they are anticapitalist. In this context they adapt a lot of social democrat, conservative, ecological and “antiglobal” ideological concepts. They are hostile towards enlightment in its later liberal interpretation – in a paradoxical way in the ideas of “emancipation” and “equality” they detect traces of the “elites”. L. G.: Who is an economical useful citizen? Is it true, that fascists are enemies of democracy – or are they only disappointed democrats? Fascist slogans often can’t be distinguished from democratic ones. Independent Ukraine is more and more split on the question of how WW II ought to be interpreted. In this context the Ukrainian public is engaged in heated debates on how certain historical personalities are to be judged, and on their due place in the national hall of fame. Meanwhile the extreme right wing Svoboda (Freedom) party is getting stronger. At this year’s Day of Victory (in WW II) it provoked open clashes with the authorities. The circumstances under which the weekly of the extreme right „Harc“ (Fight) appeared in Hungary from May 20th, 1944 on. Zoltán Bosnyák, the head of the Institute for Research on the Jewish Question, and the chief editor of Harc. The structure of Harc, its regular contributors. The main columns, the preferred topics, and the graphic appearance of the review. The activities and the fate of Bosnyák after the war. The dead ends of historical interpretation, right wing literature, and the reedition of Harc at the beginning of this millennium. In recent years the extreme right has been gaining ground everywhere in Europe and the Western world. In a number of states parties of the extreme right have entered parliaments and governments. The various groups of the extreme right, though, differ strongly as far as organisation, topics, the concept of the enemy or activities are concerned. Therefore we can distinguish between “old” and “new”, as well as between “western” and “eastern” right wing movements. In the beginning of the 1990s in the South-Slavic countries (as well as in most countries of Eastern Europe) the political pendulum deflected to the right. We might even describe the reshaping of the whole region as a kind of “national revolution” where the implementation of the national goals (the accomplishment of national independence, the creation or conservation of the unity of the national state) prevailed over the accomplishment of economic reform or consequent political democratization. As this process was accompanied by wars and economic decline (often continuing after the war period), nationalism turned into common chauvinism. 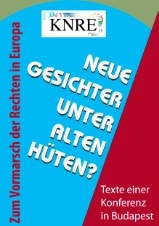 The FPÖ’s participation in the neoliberal “government of change” from 2000-2006 did not only lead to a period of decline and schism, but also of ideological regrouping towards the extreme right. Neoliberal ideas were repressed, and sometimes even critical noises against capitalism can be heard. In its election campaigns the FPÖ places the importance on „culture struggle“ against Islam and mobilises against immigrants, often being the main force in constituting “civic action groups”. The attempts of the FPÖ to create a European network comprising the groups of the extreme right should be mentioned, too. All this has led to considerable success: According to polls up to 43 per cent of Austrians would like to see the FPÖ in the government. To which traditions does the FPÖ adhere? Which danger does it constitute? Why could it achieve a comeback as a party of the extreme right in recent times and which are the perspectives for the future? ANDRÁS TÓTH: Who votes for the Jobbik? In this lecture the Jobbik shall be comprehended as a phenomenon, in order to understand how this „radical“ party of the extreme right suddenly entered the spectre of the established parties, being almost unknown some years ago. In the course of the analysis I rely on the results of two enquiries based on questionnaires from the years 2003 and 2010, on scientific literature dealing with the Jobbik, and Jobbik’s own public statements and documents. 3. didn’t flinch from replying the propaganda lies from the Franco regime on the „Reds“, thus declaring himself partisan of this dictatorship. History repeats itself: an economic crisis sweeps the world and the political tendencies towards right-wing or neofascist movements and parties grow, as well as xenophobia and racism. This means that the belief that democracy could serve as a prevention towards such thought and practice has proven incorrect. And in this aspect history also repeats itself, as every historical fascism has originated in a democratic system. The democratic fight for power evidently inspires national demands which may turn very shameless once they get the impression that someone deprives them of their success. The texts on this conference appeared in German and in Hungarian as a book. Unfortunately this book can only be obtained at the Gondolkodó Antikvárium in Budapest (1012 Budapest, Logodi u. 51., Nyitvatartás: hétköznapokon 12 és 17 óra között), but we are working on an international distribution.